PLEASE DONATE TO KEEP THE HOUR OF THE TIME ON THE AIR AND ON THE WEB! 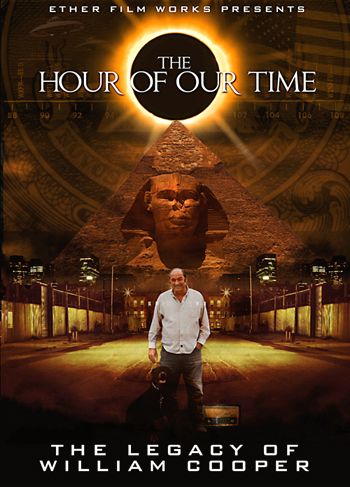 The Hour of Our Time - The Documentary on Milton William Cooper has been released! Be sure to check-out our numerous new pieces of research and new releases at our HOTT Shopping Cart. Huge holiday discounts on DVD, audio's, etc. Click here for the DVD page. Some of the new items are: The 2006 HOTT Conference DVD's, Property Rights Seminar, over 50 more audio additions to the Super Saver Audio Pages, and deep discounts on favorite DVD's and audio sets. HOTT appreciates your support, and remember that we have some massive project costs to cover in our premier release of The Hour Of Our Time, The Legacy of William Cooper. *note: Orders received after the 19 Dec 06 are subject to delays due to the rural location of the HOTT Headquarters and the holiday shipping rush. The complete DVD set of the HOTT conference 2006 is now available! Check out our HOTT SHOP for more details! All orders received to date for "The Hour of Our Time", including the freebies for HOTT CONFERENCE 2006 attendees have been shipped. Thanks for your support everyone! The Hour of Our Time IS SHIPPING! After a few delays due to printing problems and corrections, the shipments have begun. For those orders already received you should be receiving your order within a few days. Ladies and gentleman, as stated in the Hour Of The Time and Veritas News Exclusive of 18 Nov 06, there is an apparent void in research and knowledge concerning the issues of delegated authority and jurisdiction. In an attempt to educate the people of this country to stem socialism and tyrannical government, while restoring the full force of our Republic, we are embarking on a series of research essays. This is the second installment of the series and deals with the court proven necessity for delegated authority. Please read this and study it closely because proper research and information is the beginning to the restoration of our Constitution. Try out the chatroom! We're trying out some different chatting software for when we launch the new website. We have a new sale page at the HOTT SHOP! Check out the specials here. Another new DVD set now available! Property Rights. This 4 DVD set is a fully chaptered and indexed compilation of a property rights and jurisdiction seminar held on the 4th of November in Arizona. It features such speakers as Sheriff Richard Mack, Dr. Angus McIntosh, Daniel Martinez and Doyel Shamley. From land rights Doctorates to ranchers and researchers this set covers in detail dozens of topics, including but not limited to: Jurisdiction, History of property rights since the founding of our country, Affidavits, Land patents, Allodial titles, Common Law, Easements, Right-Of-Ways, roads, trails, highways and fencing, Real Estate vs. Real Property vs. Property Rights, Water rights, allotments and ownership, Mineral rights, Dozens of Congressional Laws and Supreme Court Cases. Sheriff Mack gives a concise, page-by-page synopsis of his groundbreaking Supreme Court Case. Vested Property Rights, 100th Meridian, Riparian Doctrine, Appropriation Doctrine, This is a Must have DVD set for any student or person concerned about the REAL law and our freedoms. If you do not fully understand and apply the above topics to your freedoms, then you need this DVD presentation! Listen to the first half hour of this week's Hour of the Time Radio program by clicking on the program you desire below! Ladies and Gentleman, there is a vast void of knowledge in America concerning Delegation of Authority. This, along with a lack of knowledge concerning issues of Jurisdiction are the very tool's which tyrannical government and it's minions are destroying our Republic and Constitution. Although this research has been conducted and broadcast through various means by myself in the past, there have been certain events of late, which have shown me that a refresher series is necessary. This first installment will be a cursory overview of Delegation of Authority and cases concerning said matter. For the next few weeks, we will be test-posting MP3s of the program for your listening pleasure. Please enjoy the first half hour of the following 5 programs! Keep in mind you can listen to the full program at 3pm EST and 10pm on the Christian Media Stream, or at 9pm and 10pm on the Radio Free Vermont stream. You may donate for any full program you should care to obtain on CD or cassette by viewing our HOTT SHOP. We are a listener supported endeavor. Thanks for your support! Listen to the Hour of the Time Radio program by clicking on the program you desire below! To clarify any confusion out there, the Hour of the Time is STILL being carried on our original stream at Christian Media Network - at CMRI.TV. We are aired DAILY Monday to Friday, at 3pm EST and 10PM EST on this stream. To add more streams, so that we can provide streams to more users, we are pleased to announce additional streams at Radio Free Vermont. We air on Radio Free Vermont DAILY, Monday through Friday, at 9pm EST and 10pm EST. We would like to thank James Lloyd at CMRI and Monty at Radio Free Vermont for providing these streams for us. Please show them your support by sending your thanks to them. E-mail James by clicking here. E-mail Monty by clicking here. MORE NEWS - THE NEW STREAMING SITE IS UP AND RUNNING! We are now broadcasting on Radio Free Vermont at 9pm AND 10pm EST. CLICK HERE TO LISTEN. Please let us know how the new stream works for you. E-mail us! Be sure to listen to Doyel's interview with Sheriff Mack - CLICK HERE TO LISTEN. THE HOUR OF OUR TIME NOW AVAILABLE! The Hour of the Time is pleased to announce the offical public release of "The Hour of Our Time" - the documentary produced by Ether Film Works on the life of Milton William Cooper. We are accepting orders immediately for this DVD which will commence shipping on November 15th, 2006. We are offering this DVD for a $30 donation from the general public, and only a $20 donation for HOTT CLUB members. You may pre-order this DVD NOW! Check out the HOTT SHOP for details. This DVD contains the TRUTH about Bill's life and murder and is a must view for any Bill Cooper listener. It is a highly informative and captivating work that will appeal to and peak the interest even of those folks who may have never even heard of Bill, and may wake them to the many truths Bill worked his entire life to share. Tonight's program, a wonderful interview with the filmmaker James Jankiewicz from Ether Film Works, is available as a FREE download. CLICK HERE TO LISTEN. Please be sure to support the Hour of the Time by purchasing this heart warming tribute to Milton William Cooper, one of the great patriots of our time. May you rest in peace Bill, knowing that your memory has been preserved, and that your cause is marching strongly forward.